The eggs of this pest overwinter on grassy weeds. Upon hatching in the spring, the borers feed on grasses. When the larvae become too large to feed within the grass, they migrate into fields, attacking border rows. Eliminate grassy weeds in August by mowing or use of herbicides. Scout for injury soon after the corn emerges in the spring and treat infested plants as needed. Apply insecticides to outer rows at the first sign of damage by this pest. 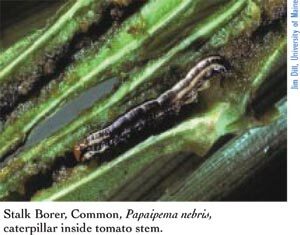 Treat small larvae before they bore into stalks.